Because The Blog from the Core simply can't cover everything. Noteworthy entries @ Insight Scoop, Lead and Gold, The Shrine of the Holy Whapping, The Remedy, Veritas, Hallowed Ground, open book, Flos Carmeli, Disputations, Democracy Project, My Public Private Journal, The Curt Jester, The Anchoress, Dust in the Light, Chrenkoff, Power Line, Catholic Light, Catholic and Enjoying It, extreme Catholic, Video meliora, Sodakmonk, Midwest Conservative Journal, Kudlow's Money Politic$, Ales Rarus, The Paragraph Farmer, Lex Communis, Still Running Off at the Keyboard, LilacRose, Grad Student Vintage 1958, WILLisms, American Digest, Cor ad cor loquitur, Apologia, Sed Contra, ThreeBadFingers, Lofted Nest: A Catholic Journey, Summa Mamas, Envoy Encore, and Insane Troll Logic. In memoriam Pope John Paul the Great. The Pope had left us for the last of his many journeys. 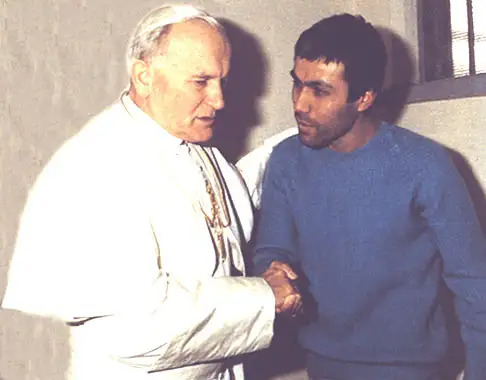 There are a lot of pictures of John Paul II floating around the web right now, among them this one with Mehmet Ali Agca, which is the image that to me most expresses what the Pontificate of John Paul II was about. He was, in all senses of the word, my spiritual father. A picture is worth a thousand words. Sometimes an old magazine cover is worth 10,000. More fearful now than death, to those fortunate enough to live in the first world, is the a long decay before death. We fear mortality but we fear a long morbidity before mortality more. Sunday evening after Mass at the cathedral, as most in attendance headed out the front door, Bernadette and I went up to stand before the Pope’s picture which had been placed just below the altar. A purple cloth was draped over the frame and the wooden tripod holding it. A small crowd soon joined us. I noticed that, aside from a few of us Anglos, most were Hispanic with lots of kids who seemed strangely interested in getting a good look. Il Papa. The picture, by the way, was beautiful, taken in his prime. Remembering too well the resplendence of those early years, I leaned over to Bern after a moment and whispered that I’d like to go now. While not Catholic, I greatly admired Pope John Paul II. He found a proper balance in valuing life while not fearing death. He was a great man and a superb example. I've been heavy of heart the past couple of days as I watch the reports of your failing health. I've been sitting here watching the link on Yahoo.com, feeling like I am standing there in the courtyard at the Vatican waiting for news of your departure from this vale of tears. Categorized as Blogworthies & Pope John Paul the Great.